Sleeping with fish will not remain a fantasy for too long. The ultra-luxury Maldives resort in South Ari Atoll is building 3 underwater hotel rooms that sit 16 feet below sea level, Maldives Finest has learnt. The structure is already in place and the project has reached near completion. Currently on going works are mainly interior tasks. This awesome project is taking place at Conrad Maldives Rangali Island, home of the world’s first underwater restaurant. While the works are on-going guests are enjoying the island as usual, obviously with no clue of what’s going on at a distance in the lagoon. It seems they have no idea that so many workers are down there building a wonder. The underwater village comprising of 3 rooms are only accessible by boat, giving guests maximum seclusion but zero privacy as fishes may be staring at you. If you bring along a shark costume that may scare off some fish but they could also become baffled to see a walking shark. Conrad Maldives underwater hotel rooms are situated at a marvelous coral garden to give guests the best experience of underwater living. Designed for lavish lifestyle, the rooms are surprisingly spacious and comes with all modern facilities to fulfill guest’s desires within the complex. No need to worry about walking up and down the 18-meter-long stairs, it comes with an elevator. If you are tired of pressing the elevator button try out a full body massage at the spa in upstairs. Dining and water sports facilities are also located in up stair complex. There is no reason to leave this world. Live as a fish, if you wish. Every room is almost entirely transparent; the three sides are made of floor-to-ceiling level acrylic glass while the roof is also made transparent with the same material. 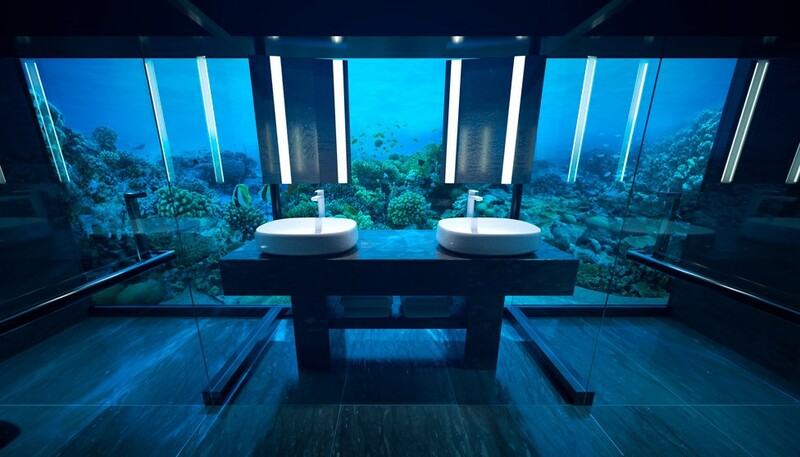 Toilet and shower facilities are also located in your underwater villa, offering uninterrupted views of the ocean. If you are feeling too shy think of the Mr. Bean series, how he hides it in embarrassing situations. Otherwise, let’s hope the resort would put some curtains around, just in case someone needs it. Now, if you are too excited to book this room right away it costs US$50,000 per night. Do not scream out just yet! This has not been confirmed by Conrad. 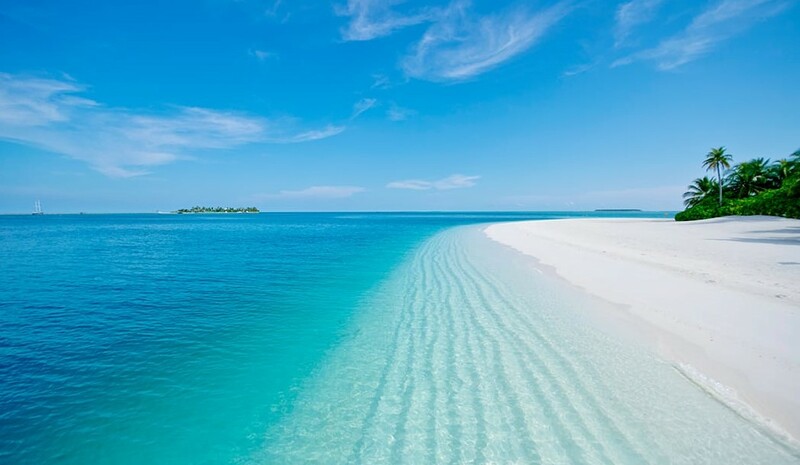 A source close to Maldives Finest said this was the price in discussion. Underwater house named Muraka will be open for guests in November 2018. The word Muraka translates to coral in local Dhivehi. 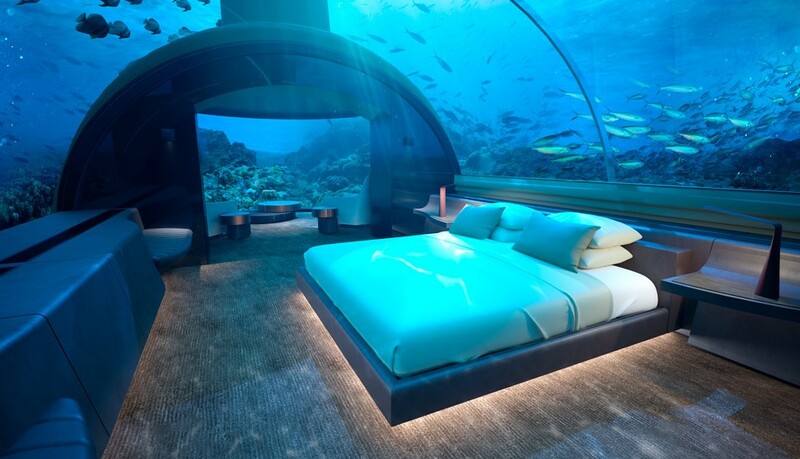 The good news is that some of the guests on Hilton HHonors membership will get a night in one of these underwater rooms for free, according to unconfirmed information. Smile! And pack your shark costume. Stay away from underpants that look like bait, unless you want to see a giant shark flying towards you to hunt down that sardine. 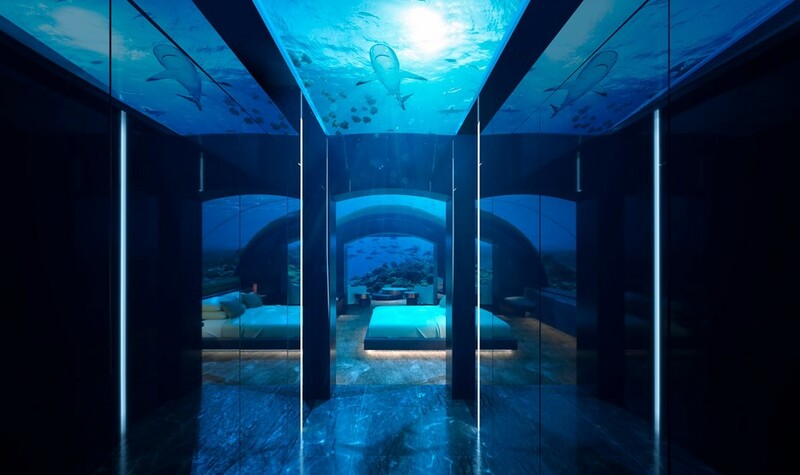 If underwater rooms are not your cup of tea you may like water villas with glass flooring. Check out our collection of some of the best glass-floored water villas. Even if you have shark-phobia these would do just fine.